Four species of sea squirt from the Bremerton Marina. From the Bremerton Marina… Tall stalked tunicate is the hairy sea squirt (Boltenia villosa). To the left and slightly behind it is the warty sea squirt (Pyura haustor). The smooth orange one in front on left is broad base or red sea squirt (Cnemidocarpa finmarkiensis). Just to the right of the broad base is the peanut sea squirt (Styela gibbsii – two of them together actually). 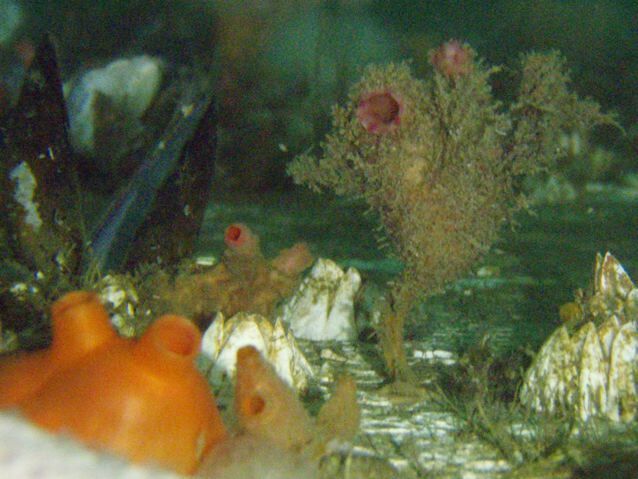 Many thanks to tunicate expert Gretchen Lambert for identifying the sea squirts in this picture.